The UK’s Dean Stockton, better known as D*FACE and Frank Shepard Fairey from the US, known as OBEY, have selected Malaga’s artistic district, SOHO, as the scene for two of their biggest projects to date. They painted two seven storey murals that sit side-by-side just behind Malaga’s ‘Centro de Arte Contemporáneo de Málaga’ (the CAC museum, or the Centre for Contemporary Art). Malaga and its surrounding areas have been causing quite a stir recently, attracting three of the biggest names in urban art in as many weeks. Firstly, Portugal's Victor Ash came and painted a mural in La Herradura, in the neighbouring Costa Tropical. Victor's visit was closely followed by D*FACE and OBEY who were invited down as part of the ongoing MAUS project (Málaga Arte Urbano en el Soho), the renovation of the centre of Malaga through art. Frank Shepard Fairey, better known as OBEY shot to international fame virtually overnight, when his Barack Obama ‘Hope’ poster came to represent the 2008 Obama presidential campaign. Obey and his team flew in from South Carolina to paint a 80’ tall x 30’ wide mural entitled “Paz y Libertad” - Peace and Liberty in only three days. Two days short of the allotted five. The mural is said to depict his wife, Amanda. The London based, Dean Stockton better known as D*FACE painted his largest mural to date on the adjoining facade of the Colegio García Lorca. The antithesis to OBEY’s theme, D*FACE chose to paint a fighter pilot. As his painted signature stated, "I'll put an end to those flyin D*Dog if its the last thing i'll ever do." “I want people to be surprised when they see it,” he said. 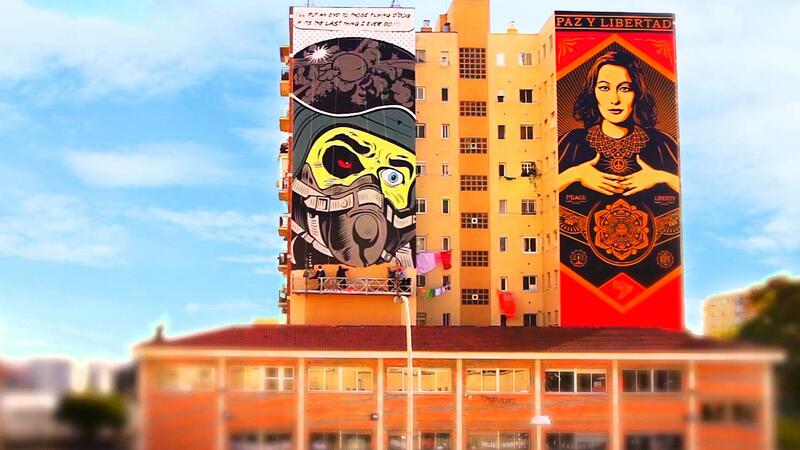 The huge seven storey murals are part of Malaga city’s MAUS project (Málaga Arte Urbano en el Soho). The privately grown initiative aims to decorate the SOHO area of Malaga with art. Locally based artists, tired of watching a prime area of Malaga’s city centre fall into dilapidation decided that art was the way forward. In 2009, a privately funded organisation was founded - first calling themselves the "Proyecto de Renovación Cultural, Comercial y Ciudadana del Ensanche de Heredia: Soho Málaga, el Barrio de las Artes." The name was eventually shortened to SOHO Malaga. The SOHO area refers to a triangularly shaped swathe of land that was once an important bourgeois neighbourhood in Malaga. It is still home to some magnificent examples of nineteenth and twentieth century architecture. Despite its central location and being home to some of Malaga’s most important cultural assets, including the CAC museum and one of Malaga’s main theatres, it has over the last 50 years, become fairly run down. The MAUS project aims to change that. The area has become synonymous with art in Malaga. New galleries have opened, impromptu exhibitions and festivals are commonplace, photography, graffiti and paintings now decorate the walls, windows, shop shutters and balconies. The neighbourhood is coming alive again. Alive with art.